A fast, non-disruptive repair solution for minimising further cracking. The 10 x 6 x1000mm stainless steel PowaTwist bars provide axial strength when reconnecting cracked masonry, eliminating the need to rebuild and absorbing further localised stress. 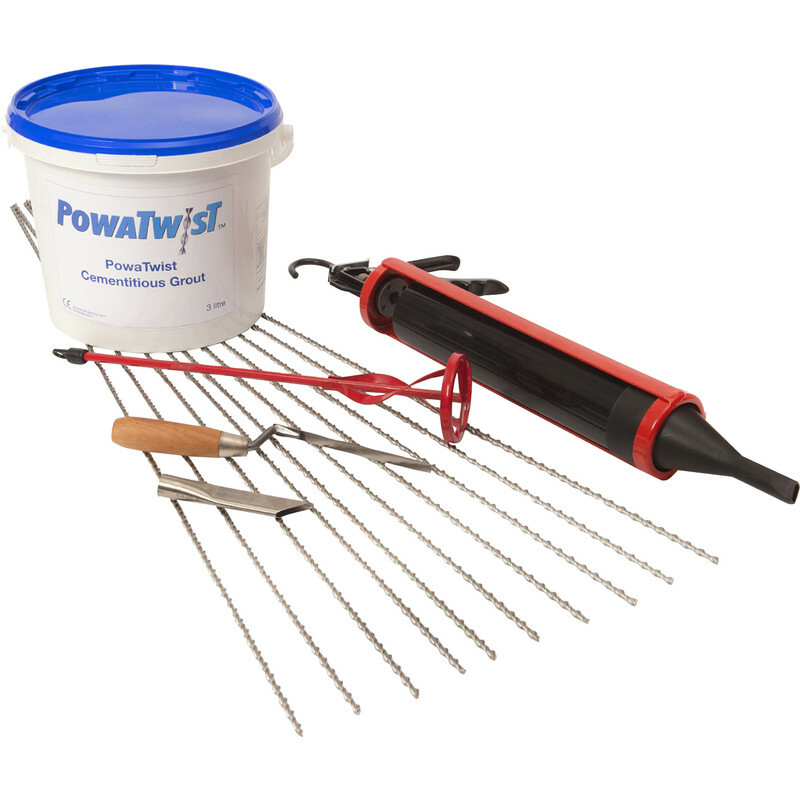 Kit includes a 3 litre tub of PowaTwist high performance cement based grout, suitable for injection with an applicator gun. When injected it fills all voids and rapidly develops compressive strength. Suitable for most substrates including concrete, brick, stone and blocks. Kit also includes crack-stitching gun, stainless steel nozzle, mixing paddle and a finger trowel. PowaTwist Crack Stitching Kit Kit is rated 2.0 out of 5 by 3. Rated 4 out of 5 by Carrott from Time will tell Only time will tell how good this is. It's been used to cement in some heli-bars to a cracked wall. I mixed, it set. Job done One caution, the instructions say not to add more liquid to the mix, which looks quite dry initially. Keep mixing (ideally with the paddle supplied in the kit and drill) and after a few minutes, the mix softens. Also, the washer in the mortar gun needs to be nipped firmly between the washers else the mix by-passes the piston. I only gave 4 stars as I await the results - no cracking - with interest. The repairs done by the pros have cracked already. Item title and description is confusing as it's easy to misunderstand and think you have ordered the whole kit. Rated 1 out of 5 by grump from Incorrect description I bought this expecting a full kit as in the description. I just got bars.